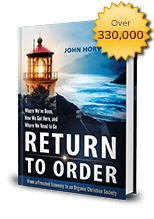 The book, Return to Order: From a Frenzied Economy to an Organic Christian Society—Where We’ve Been, How We Got Here and Where We Need to Go helps people understand better where we went wrong in our society and culture. Author John Horvat II provides insights into our society in crisis. He also outlines what a Christian society might look like. To introduce readers to the book, here are ten paragraphs taken from the text (shown in italics) that will help readers reflect upon the book’s central arguments. Each is preceded by a short introduction to put the quote in context. It is by no means a complete summary but merely a sketch of the book’s contents. Return to Order is a serious call to remake modern society. It begins with an analogy – that of a cruise ship on a never-ending cruise. Society today is similar to the ship’s atmosphere marked by fun and laughter with every effort keep the party going on board. Everybody wants the cruise to go on forever even in the face of coming dangers. In this first selected paragraph, this spirit of desiring everything instantly and effortlessly as if on a cruise is given a name: frenetic intemperance. One effect of frenetic intemperance is “gigantism,” a seemingly irresistible drive to expand, especially seen in the business world. This expansion often resorts to practices that lead to unfair advantages that undermine the free market. Such unbridled growth has unfortunate consequences like that of mass standardization of products in which the consumer becomes “standardized” and that important human touch that develops culture and tempers markets is lost. Some might think that frenetic intemperance is merely the practice of freedom that should not be tempered. It provides society with a proliferation of choices that is likewise an expression of freedom that should be encouraged. However, this can be clarified by the presentation on the true nature of freedom given below. One effect of frenetic intemperance is a secular society that is purged of all references to spiritual and supernatural things. This void leads to frustration and desolation because it fails to address man’s spiritual appetites. One way to overcome this materialistic worldview lack is to appeal to the sublime. As modern society has become more frenetically intemperate, we are compelled to look for solutions. The solution proposed by the book is what many have called an organic society. This social arrangement corresponds to man’s nature, appeals to man’ spiritual appetites, and overcomes the problems caused by today materialistic society. An organic society relies upon the extraordinary dynamism found in all living things which the author calls “vital flux.”1 This is the driving force of all the creativity and vigor that the individual has to offer society when practicing virtue. Vital flux differs greatly from frenetic intemperance. Its exuberance welcomes efforts to channel and refine one’s energies to useful purposes. It provokes economic growth with temperance. Key to the concept of an organic Christian society is the importance of relationships. Contrary to the mechanical model of society that tends to create cold bureaucratic systems, this model recognizes the role of individuals and families in the formation of society. An organic society presupposes that there be representative figures who stand out by their leadership and sacrifice for the common good. It also requires reciprocal bonds in which the talents of both superior and inferior unite to create social harmony. To create a harmonious organic society, the idea of gigantism must be replaced by the proportional-scale economy. Many believe that size is the only factor that defines the ideal economy. They hold that everything should be limited to small economic or governing units. This erroneous egalitarian notion is wrong since all men are not equal in their abilities. Many sizes of property are desirable if people develop their abilities in due proportion and temperance. Outlining the positive principles of an organic order is important. However, we must also apply these principles to our personal lives. Organic remedies are accessible to everyone since many involve very simple things that come naturally to man. However, there is no single path since the nature of organic society is to develop according to the talents, abilities, and goals of those involved. Thus, the author gives some general principles for applying these principles as can be found below. 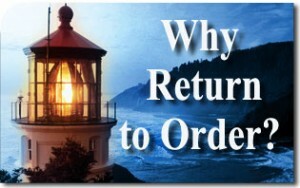 The selected paragraphs above provide only a limited view of Return to Order. These quotes are a good starting point for introducing the idea of frenetic intemperance and the notion of an organic Christian society that provides solution. The book contains many more insights that will be of great interest to the reader. May this selection inspire readers to acquire and carefully read the whole book. 1. We employ the term “vital flux” only in the sense of the dynamism of this life principle found in all living things. It has nothing to do with apparently similar concepts such as élan vital, a creative principle held by Henri Bergson to be imminent in all organisms and responsible for evolution. This entry was posted in Featured and tagged economy, freedom, frenetic intemperance, Mass Standardization, Order, Organic Society, Return to Order, sublime by Edwin Benson. Bookmark the permalink.